One paddock on the Rock Farm is typical of many others in this area. Cleared and heavily grazed in its past, it is showing evidence of years of abuse. Areas of sheet erosion and poor soil cover meant this was a paddock in desperate need of restoration. 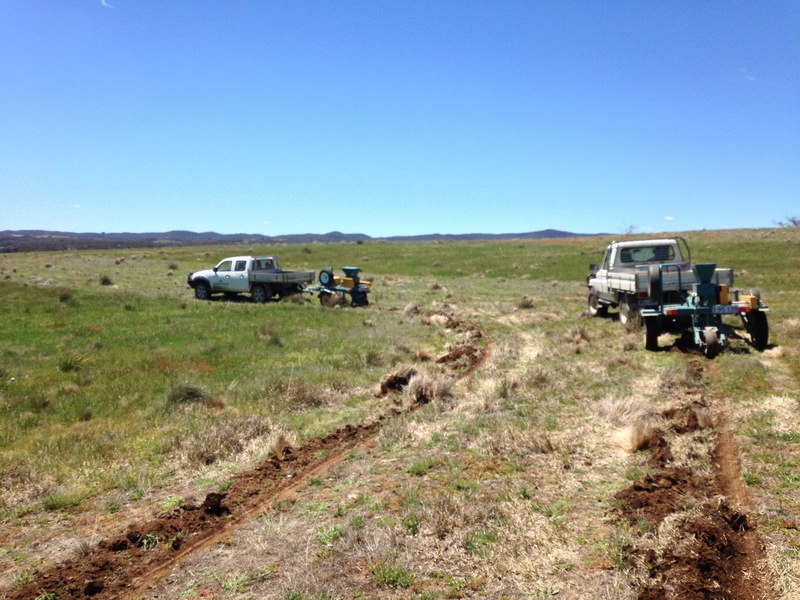 One of the first things we wanted to do to that paddock when we bought the property was to plant trees in it. With no knowledge of how to do this, we thought it best to seek out the experts. The program aims to plant belts of native trees along contours with 40-50 metres between each belt. In addition to providing habitat for many species of birds, the program also improves soil structure, reduces salinity and provides shelter and additional food sources for stock during times of drought. 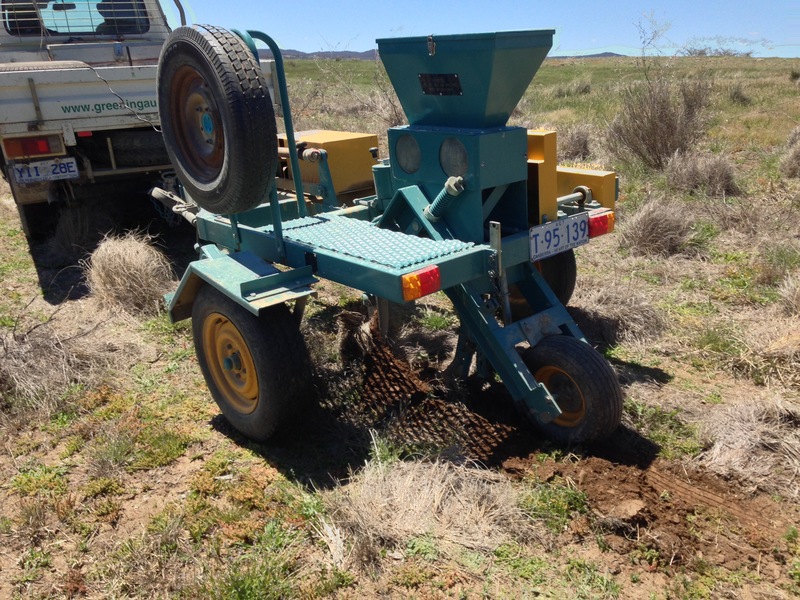 It is designed to increase biodiversity and habitat for native animals and also improve outcomes for graziers. It fits well with our aim for “sustainable and ecologically sound stewardship of our property, that creates an income and food source…” So we signed up. The first step was to mark the contours. Ben came out with a specially calibrated tool and marked the contours on the property. We then sprayed the belt in Autumn and again in Spring with glyphosate to kill the grass. Whilst I am not a fan of broad scale use of herbicides, in this case it will ensure a far greater strike rate with our trees. The glyphosate did make large brown stripes in the paddock over winter, which contrasted with the bright green grass (and our super cute lambs). Spring it is time to plant. Normally this is done in September, but with the unusually wet season, the paddock has been too boggy to work. We finally got the spring spraying done on Melbourne Cup day, and the seeding was done two days later. The seed used is a mixture of seeds from trees native to this area. We also have a some trees from other areas that are being included as part of a trial to do with climate change resilience. The seed hopper is designed to accept two types of seed, with one distributing the very fine eucalyptus seeds, and the other distributing the coarser wattles and she-oaks. A disc turns over the soil, and the seed is pressed into the soil by the trailing wheel. This places the seed in the ideal place for germination. Working in tandem, Ben and Hayden were able to get to work quickly. Four rows of trees were planted in each belt, totaling around 10 kilometres of tree lines. It took them most of the afternoon, and whilst it doesn’t look like much now, I can’t wait to see what happens over the next few years or so. Now we wait. Part of the deal is we keep stock off the paddock for five years, to allow the trees to get established. We will need to control kangaroo numbers, and keep the sheep from pushing their way through the fence. It won’t happen overnight, but it will go a long way towards making our grazing enterprise more sustainable into the future. A huge thank you to Ben and the team at Greening Australia for helping us achieve a better outcome for our native birds and animals, and our stock.